"Successful Treatment May be Achieved in Various Areas"
Initially an accurate diagnosis is the prerequisite of successful and safe treatment. On a patient's first visit, a diagnosis is reached by taking a detailed case history, which includes the present complaint and past medical history. A thorough physical examination will follow during which you will be asked to remove some of your clothing if necessary and always with your agreement. Further tests such as x-rays, blood and urine analysis could be required in some cases, depending on the condition. When the osteopath has made a diagnosis and is satisfied that osteopathic care is indicated, this will be explained to you and, with your agreement, treatment may begin. If osteopathic treatment is unsuitable, then you will be advised of this and if necessary may be referred to another practitioner. Patients have the right to stop examination or treatment at any time should they wish to. You are welcome to bring someone you know, such as a friend or relative, with you to any appointment if that would make you feel more comfortable. Treatment is based on individual needs. Techniques, which may be used, include methods for stretching tissues, passive repeated joint movement, and manipulative techniques to restore mobility and function to a joint. Active movement of muscles against resistance may also be used to restore joint movement, quality and range. Nutrition, hydrotherapy, ergonomic advice and specific exercises will commonly be included in the advice given to you by your practitioner. Thank you for visiting our clinic. We hope you find the experience helpful. Please remember that if you have any questions or concerns regarding your treatment, to contact the osteopath on the above number/email. It is not uncommon for patients to forget explanations they have been given regarding their condition, as well as exercises or advice. If this is the case, we will be happy to discuss things again before your next visit. Occasionally, people do experience some increased stiffness or pain in the first 24-48 hours after treatment, and you will be advised on how to deal with this if it occurs. However, if you are still unclear, or if any discomfort is more severe or continues longer than anticipated, please do call and we will advise you. Effective osteopathic treatment frequently requires a patient to remove some of their clothing so please come prepared. Because osteopaths take the whole body’s mechanics into account, we will often need to examine or treat areas other than where you are experiencing pain. For example, an ankle injury may require us to look at the knee, hip or lower back. You are welcome to bring loose jogging bottoms or shorts if you prefer, but please do tell the osteopath if you are not comfortable with any request to remove clothing. As a patient, you have the right to stop examination or treatment at any time, should you wish to. 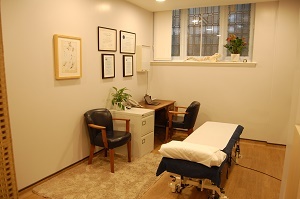 You are also always welcome to bring a friend or family member with you to appointments. We ask for children under 16 to always be accompanied by an adult. If you need to change or cancel your appointment, please give us at least 24 hour’s notice. Failure to do this may mean that someone else, who is in pain, will be denied treatment. In addition, it is extremely difficult for the practitioners to run an efficient clinic service when appointments are cancelled late or if patients do not show up. We do charge for appointments cancelled within 24 hours and we ask for your understanding. Health insurers generally give an authorisation code for your course of treatment. However, this is not a guarantee of full, or even partial payment, to your practitioner. Please advise the osteopath of any excess amount on your policy as this, and any other outstanding fees not covered by the insurance company, are then your responsibility and must be paid directly to the clinic. We aim to ensure your experience at our clinic is helpful and professional. If you feel unhappy in any way regarding your visit, please contact us as soon as possible so that we can try and rectify the issue. If you prefer to speak with a different practitioner to the one you have seen (possibly an osteopathic mediator from another practice), then please ask for this when you call, email or write. We aim to deal with all concerns as quickly and efficiently as possible. However, if your concern is not dealt with to your satisfaction by the clinic or any mediator it provides, the final port of call would be to contact the General Osteopathic Council, which is the statutory regulator of all osteopaths in the UK. www.osteopathy.org.uk, 0207 357 6655. We hope you will accept the above guidance as reasonable. However, if you do not, or you have any questions regarding the above information, please inform your practitioner at the earliest opportunity. Thank you for choosing the Active Health Clinic. We look forward to assisting you in your recovery.